The Wellfleet skate Park is off the beaten path and the nearby roads are kinda narrow. 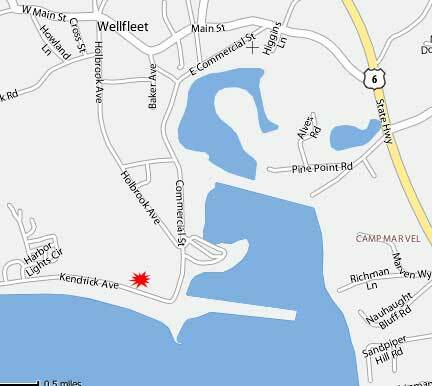 Follow Route 6 East (although most of the trek is due North) into Wellfleet. You'll pass by the Wellfleet drive-in theater on your left and the Marconi Wireless site on the right. Watch for the big green signs for "Welfleet Center". At the first major intersection with traffic light, turn left onto Main St.
turn right onto Kendrick Ave. 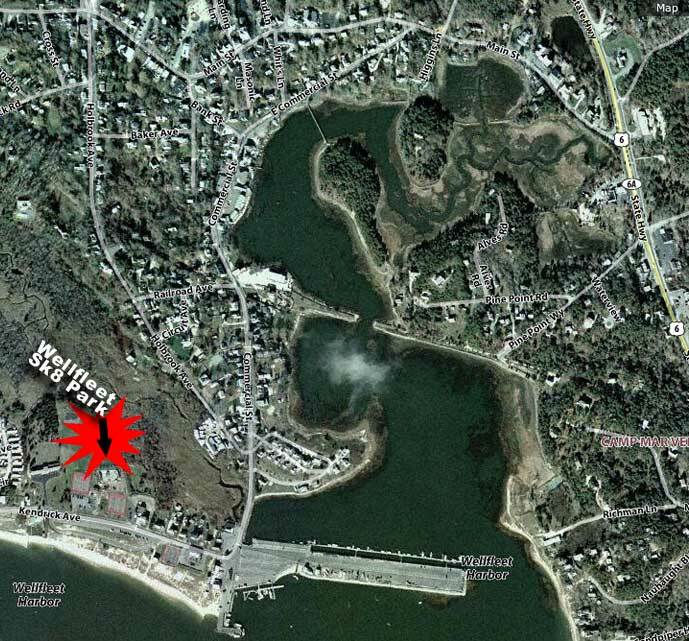 The Wellfleet Skatepark is on the right in Baker's Field about a ¼ mile from the harbor. You'll see a large playground and tennis courts. Across the street is Mayo Beach. There are a few Visitor Centers on route 6 that can straighten you out if you spaz on the directions. There's not much parking for the Baker's Field area, where the skate park is located, but there's a lot more right across the street at Mayo Beach. The Wellfleet Skate Park used to be full of rusted metal ramps before the new concrete park was built. On the upper deck is a small pool with concrete coping and 3 stairs at the shallow end. The pool looks over the rest of the skate park. Right next to the skatepark is a good sized playground with slides, tunnels and all sorts of things to climb. The parking lot adjacent to the skate park, tennis courts and playground is fairly small, but there is a lot more public parking across the street at Mayo Beach on Wellfleet Harbor. View: Across the street at Mayo Beach looking at Baker's Field and the Wellfleet Skate Park.